The global heart valve devices market features a fairly fragmented landscape, notes Transparency Market Research (TMR). This can be attributed to the presence of several players with global presence in the heart valve devices market. A growing number of players are capitalizing on emerging opportunities from the strides made by healthcare systems. In addition, several players are focusing on unveiling technologically-improved products to consolidate their positions in the heart valve devices market. Top players are likely to focus more on better medical services to garner stronghold in the global heart valve devices market. Growing number of strategic partnerships and acquisitions by prominent companies has upped the ante in the market. Some of the key players operating in the global heart valve devices market are TTK HealthCare, Medtronic, Boston Scientific Corporation, CryoLife, Inc., JenaValve Technology, Inc., and JenaValve Technology, Inc. 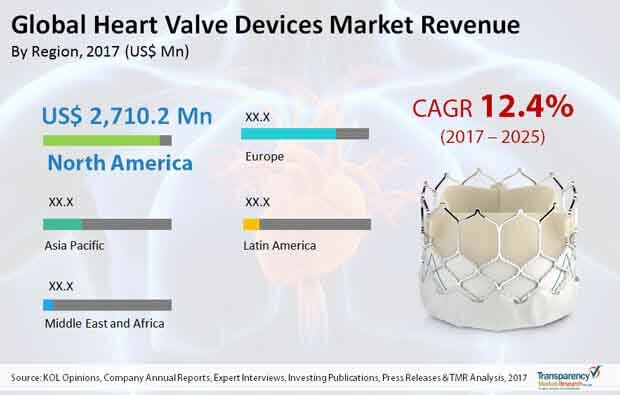 The global heart valve devices market stood at US$5.8 bn in 2016 and the market is projected to touch a valuation of US$16.2 bn by the end of 2025. The market is projected to rise at an impressive CAGR of 12.40% during 2017–2025. Regionally, Asia Pacific is expected to rise at the most attractive CAGR of 13.3% during 2017–2025. The rapidly expansion in the regional market for heart valve devices rides on the back of constantly improving healthcare infrastructures and rising incidence of various heart valve diseases. Among the different types of heart valve devices, transcatheter type presently accounts for the major share in the global heart valve devices market. The segment is likely to retain its lead in the coming few years as well. The growth is propelled by the vast uptake in developed markets and the effectiveness of the devices in reducing the mortality rate in patients. The global demand for heart valve devices is driven by the rising incidence of various heart diseases, especially coronary heart disease that makes for substantial mortality in patients with cardiovascular heart diseases. Growing inclination toward less invasive treatment approaches for complex heart disorders, notably mitral regurgitation, is boosting the market. The strides in the heart valve devices market is propelled by ceaseless advances in therapeutics pertaining to mitral valve repair techniques. The constant flux of new devices that are unveiled in the heart valve devices market contributes to constant stream of revenues for companies. Moreover, with technological advancements heart valve devices have risen in efficacy, functionality, and safety. The advent of functional mechanical designs is a case in point. One of the potentially favorable development in the heart valve devices market is rising acceptance rate of transcatheter mitral valve devices in high-risk patient, especially in countries with developed infrastructure. Emerging economies are expected to play an increasingly significant role in the future growth trajectories of the heart valve devices market in the near future. The growth will be supported by rapid advances being made in their healthcare systems. A great deal of progress in the healthcare infrastructure is undoubtedly supported by initiatives by governments and a favorable reimbursement scenario. However, developing markets still face the lack of affordability of heart valve devices. Moreover, technologically-advanced heart valve devices have still not made wide commercialization in several emerging economies. Nevertheless, these markets will witness positive changes from the rapid technological advances in their healthcare sectors. In addition, the dynamic evolution in the valve technologies by medical device manufacturers in the regions will create new avenues over the forecast period. The study presented here is based on a report by Transparency Market Research (TMR) titled “Heart Valve Devices Market (Product Type - Mechanical Heart Valves (Aortic Valves and Mitral Valves), Biological Heart Valves (Aortic Valves, Mitral Valves, Pulmonary Valves, and Tricuspid Valves), and Transcatheter Heart Valves (Aortic Valves, Mitral Valves, and Pulmonary Valves); End User – Hospitals and Ambulatory Surgical Centers) - Global Industry Analysis, Size, Share, Growth, Trends, and Forecast 2017–2025”.